The statement went on to denounce the US government for funding Israel’s war machine and other Western states for protecting Israel diplomatically. “Genocide begins with the silence of the world,” it warned. Significantly, the statement was drafted as a repudiation of a vile advertisement published over the name of Elie Wiesel that compared Hamas, the Islamist ruling party in Gaza, to the Nazis, accusing it of engaging in “child sacrifice” by using civilians as “human shields.” This is the lie employed by the Israeli state to justify its slaughter of over 2,100 Palestinians, including 577 children, since July 7. The signatories to the letter by Holocaust survivors declared themselves “disgusted and outraged” by Wiesel’s “abuse of our history… to justify the unjustifiable” mass killings in Gaza. 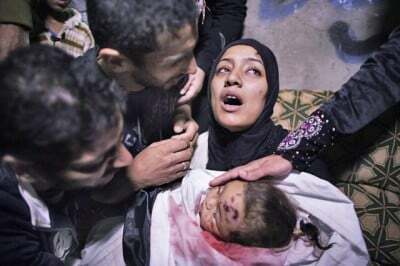 The brutality of the latest Israeli war on Gaza has shocked and outraged people all over the world, including many Jews. The wanton killing of civilians and the massive destruction of homes, hospitals, schools, mosques and infrastructure such as water, electricity and sanitation give the impression of an Israeli regime that has lost its head. This slaughter flows inexorably from the logic of Zionism and the principles upon which the Israeli state was founded. It is by no means an aberration, following a decades-long series of one-sided bloodlettings, from the Deir Yassim massacre of 1948 through to successive rounds of mass killing in Gaza, the West Bank and Lebanon. The current military campaign against the 1.8 million Palestinians of Gaza, however, is among the most brutal, and it has been accompanied by a wave of right-wing hysteria and chauvinism that at times echoes the politics of the Nazi regime itself. This only serves to underscore that 66 years after the founding of the state of Israel, the Zionist project has reached a dead end, and no amount of bombs, missiles and shells can overcome its intractable contradictions. Zionism as a movement has always fed off of the defeats of the working class and pessimism generated by the crimes of the capitalist system. It developed a mass following thanks to World War II and the Nazi Holocaust, combined with the betrayals of the Soviet Stalinist bureaucracy. Before then, Jewish workers and intellectuals had looked to the workers’ movement and the struggle for socialism as the means of eradicating all forms of oppression, including anti-Semitism. Israel was based on the negation of this perspective. Zionism’s ethnic and religious nationalism and the establishment of the state of Israel were justified with the contention that the Holocaust was inevitable and that its repetition could be prevented only through the establishment of a Jewish state based upon the dispossession of the Palestinians. The atrocities of the Nazis were invoked as a defense against any criticism of the crimes against humanity carried out by the Israeli state itself, which in Gaza, Lebanon and elsewhere employed tactics that resembled nothing so much as the siege of the Warsaw Ghetto. Thus, the letter signed by the Holocaust survivors and descendants of survivors strikes at the heart of Zionist ideology. It embodies the universalist, humanitarian, liberal and even socialist ideals with which the Jewish people had been identified for generations—ideals that made them a target of Nazism and the political right, and which today provoke the fury of their counterparts within Israel itself. In this sense, it is indicative of a deep-going crisis developing within Israeli society. The political prescription offered by the letter is a “full economic, cultural and academic boycott of Israel.” The World Socialist Web Site is not in agreement with this approach. It amounts to a moral appeal to the capitalists in the US and Europe to exert pressure on their Israeli counterparts to accept the so-called “two-state solution”—an unviable trap for the Palestinian people—as a more sustainable means of defending their profit interests. Inasmuch as Israel’s crimes would be impossible without the support of the United States and the other major powers, the call for a boycott raises the obvious question of “why stop at Israel?” Why not a boycott of the US, Britain, etc.? And rather than an academic boycott, those opposed to the crimes being carried out in Gaza should fight for the maximum interaction with Israeli academics and intellectuals as part of the fight to develop a principled opposition to the Israeli state. Most importantly, there is a working class and a class struggle in Israel, one of the most socially polarized countries on the planet. It is to this social force—the working class—that those seeking to put a stop to the unending war and social reaction embodied in Zionism must turn. The only way out of the present bloody morass lies through the struggle to unite Jewish and Palestinian workers within Israel with the Arab working class of the region as a whole, drawing the fight against Zionism into the mainstream of the fight against imperialism and the struggle for the socialist transformation of society on a world scale.